Home Diet & Nutrition Being Vegetarian Can Vegans Eat Mushrooms? You will find many vegans not eating mushrooms as it is not a plant product. Some people claim that mushrooms are neither plant nor animal, but they are closer to animals. You will find many vegans eating mushrooms without any issue. So, are mushrooms vegan or not? and can vegans eat mushrooms? Mushrooms are neither plants nor animals. Unlike plants, they don’t need sunlight to prepare their food through photosynthesis. Unlike animals, they don’t have a central nervous system to feel pain. Mushrooms are the fruits of fungi that grow underground in humid conditions. Under the cap of the mushrooms, there is a tissue called veil. When a mushroom matures, the veil pulls away from the stem and exposes the gills. Unlike plants and animals, mushrooms don’t have seeds or eggs; they have spores. Billions of spores are attached to the gills. Farmers plant the mushroom spores in compost beds to grow new mushrooms. Under natural conditions, the spores are dispersed by the wind to grow more mushrooms. The fungus grows from the spores under the surface of the bed. The mushroom fungus is called Mycelium, and it works like the root system of the mushroom. Mycelium reaches the surface of the bed within two or three weeks, and then the mushroom pops out. Fungi are not plants as they do not photosynthesize and prepare their food with sunlight. Their cell wall is made of chitin and not the cellulose found in plant cell walls. They absorb moisture and nutrients directly from their surroundings such as a compost bed or a fertile soil in a forest. As fungi don’t photosynthesize and need to search their food in their surroundings, some people claim them to be closer to animals than plants. They fail to understand that animals cannot absorb nutrients from the soil directly, but fungi do that. Unlike animals, they don’t have a central nervous system to feel pain. Fungi belong to a kingdom of life distinct from animals, plants, and bacteria. Mushrooms are the shooting bodies of many macro fungi. What is Veganism and what do Vegans Eat? Veganism is a practice of minimizing the animal suffering by not consuming any animal products for food or any other reasons. To reduce animal suffering, vegans do not consume any animal products. Meat Industry is not environment-friendly. Vegan diets can promote fat-loss and help detoxify the body. Vegans do not eat meat, fish, eggs and dairy products. A vegan diet is primarily based on plant food. It typically includes fruits, vegetables, nuts, seeds, grains, legumes, and beans. When people search for the alternatives of animal products, they naturally shift to plant products. However, they are not aware of another form of life that does not belong to the animal kingdom or the plant kingdom. Can Vegans Eat Mushrooms ? Absolutely. Vegans can eat mushrooms without being concerned about causing suffering to living beings or burdening the environment with their choices. Vegans can eat mushrooms without any issues for the reasons listed below. Just like plants, mushrooms don’t have any Central Nervous System(CNS) to feel pain. When we slaughter an animal, the electrical impulses travel to the brain via nerves and cause suffering to the animal. Popping out mushrooms or cutting away their stem with a knife does not cause any pain at all. Slaughtering animals for food creates environmental issues as a significant number of animals need to be slaughtered for daily human consumption. An Even greater amount of crops and grass is required to feed those animals that will later be consumed by humans. Eating plant based foods significantly reduce the burden on the earth. Mushrooms thrive on the ground and use nutrients directly from the soil for their growth. Eating mushrooms do not create any environmental concerns. 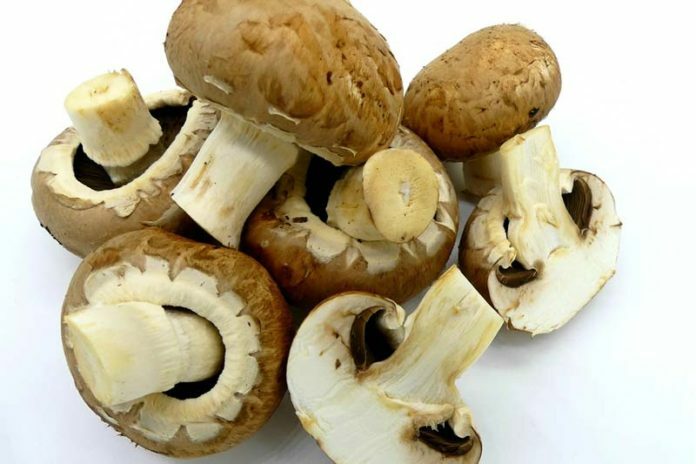 Mushrooms are rich sources of many Vitamins and Minerals such as Vitamin B, Vitamin C, Vitamin D, Calcium, Potassium, Selenium, Fiber, and Antioxidants. Mushrooms do not cause any health concerns like many animal products such as cardiac issues, high cholesterol, etc. Mushrooms are not plants, but vegans can eat it as it is not an animal product either. Mushrooms are fungi and do not belong to the plant or animal kingdom. When you eat mushrooms, you don’t cause any suffering to them as they don’t have a CNS to process pain. They are loaded with nutrients and eating mushrooms does not cause any harm to the environment. This is Ella Wilson, the founder of TinyPlantation.com. I have a great interest in plants and gardens and I am fascinated with fruits and vegetables. I wish to share my passion with you through this website. Feel free to read my articles and guides and share them with others who might benefit from them. You can reach out to me anytime if you have questions.